Thermo-mechanical processing is a metallurgical process that integrates plastic deformation with heat treatment. Ausforming is a major example of the thermo-mechanical processes. In the ausforming process, austenite is deformed to obtain work-hardened austenite followed by quenching to cause martensite transformation. The major characteristic of the ausformed martensite is that the strength of the martensite is increased without decrease in toughness and ductility1). In the typical conventional ausforming process, the plastic deformation is conducted in a low temperature region of unrecrystallized austenite prior to quenching. In order to obtain the work-hardened austenite in such a region, highly alloyed steels having high hardenability (large metastable austenite region) are necessary. Moreover, the deformation becomes difficult because the flow stress of austenite extremely increases in such a region. Because of the abovementioned restrictions, conventional ausforming has not been applied in practice2). High-temperature ausforming (modified ausforming), the deformation of which is conducted in a stable austenite region at high temperatures, was proposed3). The strength of the martensite obtained by high-temperature ausforming is not as high as that obtained by conventional ausforming; however, it has an advantage in terms of its applicability to low alloy steels. In addition, it has beneficial effects when low alloy steels are employed from the aspects of anti-hydrogen embrittlement4–8), fatigue strength3), and, in particular, gigacycle fatigue strength9,10). Therefore, high-temperature ausforming is considered to be an effective process to simultaneously improve the strength and various anti-fracture properties of low alloy steels. In the high-temperature ausforming process, the inhibition of austenite recrystallization during the period from hot-deformation to quenching is necessary to obtain the work-hardened austenite. To inhibit recrystallization, the extension of the non-recrystallization austenite region to higher temperatures is effective by adding a small amount of microalloying elements such as Nb and Ti. There are many studies which investigate the effects of alloying elements on the static recrystallization behavior of work-hardened austenite using steels with approximately 0.1 mass% carbon (hereinafter, abbreviated as %). For example, Maehara et al.11) investigated the effects of alloying elements using 0.1%C–0.3%Si–1%Mn steel as a base system. They reported that the addition of any element such as Si, Mn, Cu, Ni, Cr, Mo, V, and Nb inhibits recrystallization. Among them, Nb has by far the strongest inhibition effect. Cuddy12) investigated the effects of Nb, Ti, Al, and V contents on the recrystallization-stop temperature using 0.07%C–0.25%Si–1.4%Mn steel as a base system. The author reported that the recrystallization-stop temperature of the steel with Nb is by far the highest, followed by Ti, Al, and V, respectively, when the added amounts of the alloying elements are the same. They also reported that the effect of adding V on the recrystallization-stop temperature is considerably small. Boratto13) et al. proposed an equation to predict the effects of alloying elements on the recrystallization-stop temperature by analyzing own experimental and literature data of 0.04–0.17%C steels. According to the equation, Nb has the strongest inhibition effect on recrystallization, followed by Ti, Al, and V, respectively. Yamamoto et al.14) investigated the effects of solute alloying elements on the recrystallization behavior using 0.002%C–0.002%N steel as a base system. They reported that the solute Nb and Ti have the strongest inhibition effect on recrystallization, followed by Mo and V, respectively. These reports agree well in the sense that Nb has a considerably strong inhibition effect on recrystallization, while V has a relatively weaker effect. In contrast, there is a limited number of previous studies that investigated the recrystallization behavior of work-hardened austenite of spring steels having 0.5–0.6% carbon from the viewpoint of applying a high-temperature ausforming process to high carbon spring steels. Barani et al.15), Sugimoto et al.16) and Ayada et al.17) reported that the adding V has a relatively strong inhibition effect on recrystallization. As mentioned above, the effect of V on inhibiting recrystallization is considerably weaker when low carbon steels are used. In contrast, it is interesting enough to mention that the strong inhibition effects on recrystallization are reported when spring steels with a relatively large amount of carbon are used. However, there are few systematic studies that have investigated the effects of alloying elements on the recrystallization behavior of work-hardened austenite of high carbon steels. Therefore, the present study aims to systematically investigate the effects of alloying elements on the recrystallization behavior of work-hardened austenite of spring steels with 0.55% carbon. Table 1 shows the chemical compositions of the used steels. Steel A is a steel corresponding to SAE9254 which is a typical steel grade for spring steels. Steel B is a steel to which Al is not added, as compared with Steel A. The others are steels for investigating the effects of Nb addition (Steel N1, N2), V addition (Steel V1, V2), Ti addition (Steel T1), and the combined addition of Ti and B (Steel T1B). The 16 kg ingots, which have the chemical compositions listed in Table 1, were prepared by vacuum induction melting. They were hot-forged to round bars of 30 mm in diameter. The round bars were then homogenized at 1300℃ for 2 h and normalized at 925℃ for 0.5 h. Subsequently, they were austenitized at 1250℃ for 0.5 h, and then cooled to 1050℃, followed by compressing the material from 30 to 13 mm in height and cooling to room temperature. Consequently, fine ferrite/pearlite microstructures were obtained. Cylindrical specimens for a hot-deformation simulator (THERMECMASTOR-Z, Fuji Electronic Industrial Co., Ltd.), 8 mm in diameter and 12 mm in height, were cut from the hot-forged round bars. Table 1 Chemical compositions of steels used (mass%). 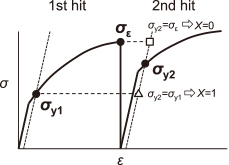 where σy1, σy2, and σε are the yield stress of the first-hit, the second-hit, and the maximum flow stress of the first-hit, respectively. Both the softening due to static recovery and the softening due to static recrystallization are included in X. When the austenitizing temperature is changed, the recrystallization behavior can be affected through the change in the initial austenite grain size and the solute contents of the alloying elements in austenite. In order to investigate this point, 1200℃, 1050℃, and 950℃ were selected as the initial austenitizing temperatures. When the deformation and holding temperature is lower than 800℃, stable austenite cannot be obtained because ferrite transformation commences in the base system. Therefore, 900℃, 850℃, and 800℃ were selected as the deformation and holding temperatures. The true stress–true strain curves were measured by analyzing data of the displacement and load. Then, the softening ratio X was determined from eq. (1). The yield stress was determined using the 2% offset method. Conditions of the double deformation test. Schematic illustration of the stress–strain curve from the double deformation test. The relationship between the static recrystallization behavior measured by the double-hit compression test and the change in the actual microstructure was investigated by applying a method of reconstructing the parent austenite orientation map from an EBSD (electron backscattering diffraction) orientation map of daughter lath martensite19–21). A very good relationship was confirmed between them22). The amount of precipitates in Steel N2, V2, and T1 were measured by the electrolytic extraction method to determine the contents of solute alloying elements in austenite. The specimens were heated with a heating rate of 50℃/s then held at 950–1200℃ for 10 s. Subsequently, they were quenched to room temperature using helium gas with a cooling rate of 60℃/s. The electrolyte solution used for the electrolytic extraction was a 10% AA electrolyte (10 vol% acetylacetone (AA)–1 mass% tetramethylammonium chloride–methanol solution). The specimens were electrolyzed and the residue was collected by filtration using 0.2 µm pore size membrane filters. The contents of the alloying elements in the whole precipitates were quantified using ICP (inductively coupled plasma) atomic emission spectroscopy. 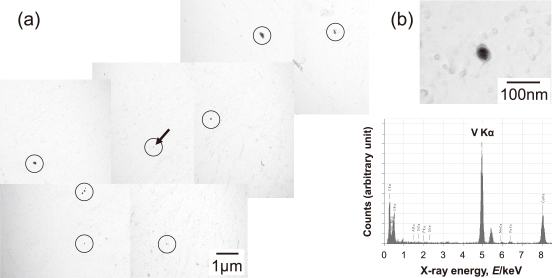 Martensite structures of the specimens, obtained after heating at initial austenitizing temperatures followed by quenching, were observed with optical microscopy in order to estimate the initial austenite grain diameters. The specimens were etched with saturated aqueous picric acid containing a small amount of sodium dodecyl benzenesulfonate to reveal prior-austenite grain boundaries. In order to clarify the mechanism on the inhibiting effect of alloying elements on recrystallization, their states were investigated by means of TEM (transmission electron microscopy) observation and APT (atom probe tomography) analysis. Samples for the TEM observation were prepared by the extraction replica method. Precipitates in the steels were extracted by controlled potential electrolysis; then, the carbon replica samples were obtained. The electrolyte used was a 10% AA electrolyte, same as that described in section 2.3. The electrolysis potential and the amount of electricity used were −250 mV vs. SCE. and 2 C respectively. STEM (scanning transmission electron microscopy) integrated into a field emission transmission electron microscope (JEM 2100F, JEOL Ltd.) was used for the TEM observation. FIB (focused ion beam) with a lift-out system was used to prepare the specimen for the APT analysis. A small block of 10 × 10 × 80 μm, chosen randomly from the volume of 1 × 1 × 1 mm located in the center region of the THERMECMASTOR-Z specimen, was cut out by the lift-out method. Then, a sharp needle was fabricated using FIB milling23). LEAP 4000XHR (CAMECA Instruments Inc.) with laser pulse mode was used for the APT analysis. The temperature of the specimen and the laser pulse energy were −223℃ and 30 pJ, respectively24). Three-dimensional (3D) elemental mapping was obtained by measuring data on 20 million atoms with an ion detection efficiency of 0.38. The measured amounts of Nb, Ti, and V in the extraction residue were assumed to be the contents of these elements which are forming precipitates at the austenitizing temperature. Subsequently, the solute contents of Nb, Ti, and V in austenite were determined by subtracting the contents of the elements forming precipitates from the total contents of these elements listed in Table 1. The relationship between the solute alloying elements contents and the austenitizing temperature is shown in Fig. 3. The contents of solute alloying elements, which were calculated by the solubility products proposed by Narita25), are also shown in Fig. 3. Here, Ti and N in the Ti bearing steels are assumed to constantly form TiN in proportion to the N contents throughout the temperature range because TiN has a very small solubility product. Therefore, the Ti contents precipitated as TiN were subtracted from the total Ti contents in Table 1. The subtracted values (Total [%Ti] − (47.9/14)[%N]) were used in order to calculate the solute Ti contents from the solubility product of TiC. In the case of Steel N2 (0.01%Nb), all the added Nb is in solution when the austenitizing temperature is 1200℃, but the contents of solute Nb decrease with a decrease in the austenitizing temperature, e.g. 1050℃ and 950℃. In the case of Steel T1 (0.035%Ti), not all the added Ti is in solution even when the austenitizing temperature is 1200℃. In contrast, in the case of Steel V2 (0.1%V), all the added V is in solution even when the austenitizing temperature is as low as 950℃. 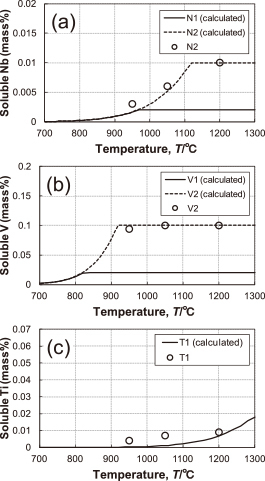 Soluble Nb, V, and Ti contents as a function of the austenitizing temperature; (a) N1 and N2, (b) V1 and V2, and (c) T1. The austenite grain diameters at the austenitizing temperature 950℃ were approximately 10–20 μm and there was little difference depending on the investigated steels. The austenite grain diameters at 1200℃ were approximately 50–100 μm. The austenite grains of Steel T1 and Steel T1B at 1050℃ were composed of mixed grains with the two different diameters, which were approximately 10 and 20 μm. The austenite grain diameters of other steels at 1050℃ were approximately 20–30 μm. In any case, there is no remarkable difference in the austenite grain diameters depending on the investigated steels. Figure 4 shows the softening behavior of the work-hardened austenite of Steel B which is the base system of this study and that of Steel A which contains 0.035% Al. The softening curves of Steel B (Fig. 4(b-1), (b-2), (b-3)) are shifted towards the shorter time side when the austenitizing temperature becomes lower. The solute contents of the alloying elements added to Steel B do not depend on the austenitizing temperature because all the alloying elements can be in solution throughout the austenitizing temperature range of this study. Therefore, the effect of the austenitizing temperature on the softening behavior is considered to be an effect of the initial austenite grain size. Initiation of recrystallization can be promoted due to the increase in area of the grain boundaries which is the major nucleation site of recrystallized grains. The area is expected to increase due to the decrease in the initial austenite grain size. Consequently, the softening curves are shifted towards the shorter time side when the austenitizing temperature becomes lower. The recrystallization behavior of Steel A is almost the same as that of Steel B. Therefore, the effect of the Al addition is not observed expressly. Softening ratio as a function of holding time; (a-1) Steel A (0.035%Al), austenitizing temperature 1200℃, (a-2) Steel A, 1050℃, (a-3) Steel A, 950℃, (b-1) Steel B (base steel), 1200℃, (b-2) Steel B, 1050℃, (b-3) Steel B 950℃. The effect of the Nb addition is shown in Fig. 5. The recrystallization was retarded by the Nb addition because almost all the softening curves in Fig. 5 were shifted toward the longer time side more than those of Steel B in Fig. 4. In particular, in the case of Steel N2 (0.01%Nb), the recrystallization was considerably retarded when the austenitizing temperature was 1200℃. Softening ratio as a function of holding time; (a-1) Steel N1 (0.002%Nb), austenitizing temperature 1200℃, (a-2) Steel N1, 1050℃, (a-3) Steel N1, 950℃, (b-1) Steel N2 (0.01%Nb), 1200℃, (b-2) Steel N2, 1050℃, (b-3) Steel N2 950℃. The effect of adding V is shown in Fig. 6. The recrystallization behavior of Steel V1 (0.02%V), which contains a small amount of V, is almost the same as that of Steel B in Fig. 4. In contrast, in the case of Steel V2 (0.1%V), recrystallization is considerably retarded when the deformation and holding temperature becomes lower. In particular, very strong retardation effects are observed in cases of the deformation and holding temperatures of 800℃ and 850℃ (Fig. 6(b-1)), and of 800℃ (Fig. 6(b-2)). Softening ratio as a function of holding time; (a-1) Steel V1 (0.02%V), austenitizing temperature 1200℃, (a-2) Steel V1, 1050℃, (a-3) Steel V1, 950℃, (b-1) Steel V2 (0.1%V), 1200℃, (b-2) Steel V2, 1050℃, (b-3) Steel V2 950℃. The effects of adding Ti and of the combined addition of Ti and B are shown in Fig. 7. Recrystallization of Steel T1 (0.035%Ti) is considerably retarded when the austenitizing temperature is 1200℃ (Fig. 7(a-1)). This tendency is the same as that of Steel N2. The recrystallization behavior of Steel T1B (0.034%Ti–0.0021%B) is almost the same as that of Steel T1. Therefore, the extra effect of adding B is not observed expressly. Softening ratio as a function of holding time; (a-1) Steel T1 (0.035%Ti), austenitizing temperature: 1200℃, (a-2) Steel T1, 1050℃, (a-3) Steel T1, 950℃, (b-1) Steel T1B (0.035%Ti–0.0021%B), 1200℃, (b-2) Steel T1B, 1050℃, (b-3) Steel T1B 950℃. Data of the 50% softening time were extracted from the softening curves in Figs. 4–7 as a parameter which indicates the inhibition ability of recrystallization. Then, this parameter was plotted against the contents of the alloying elements to compare the inhibition ability among the added alloying elements. Figure 8 shows the effects of Al, Nb, V, and Ti contents on the inhibition abilities of recrystallization. Effects of Al, Nb, V, and Ti contents on the 50% softening time; (a-1) Austenitizing temperature: 1200℃, deformation and holding temperature: 900℃, (a-2) 1200℃, 850℃, (a-3) 1200℃, 800℃, (b-1) 1050℃, 900℃, (b-2) 1050℃, 850℃, (b-3) 1050℃, 800℃, (c-1) 950℃, 900℃, (c-2) 950℃, 850℃ and (c-3) 950℃, 800℃. Nb has the strongest effect on the inhibition of recrystallization, followed by Ti and V, respectively, when the contents of the alloying elements (mass%) are the same. Recrystallization seems to be slightly promoted by adding Al, but it is probably within the experimental error because the difference between the Al-added steel and the base steel is very small. The effect of adding V on the inhibition of recrystallization does not appear when the deformation and holding temperature is high (900℃) (Fig. 8(a-1)). This result is in good agreement with the fact that the effect of V on the recrystallization-stop temperature is smaller than the effects of Nb and Ti12,13). However, the very strong effect on the inhibition of recrystallization by the adding 0.1% V appears when the deformation and holding temperature is low (850℃, 800℃) (Fig. 8 (a-2), (a-3)). The 50% softening time delayed by adding 0.1% V is longer than when 0.01% Nb and 0.035% Ti are added. That is, 0.1%V steel exhibits the strongest effect on inhibiting recrystallization. 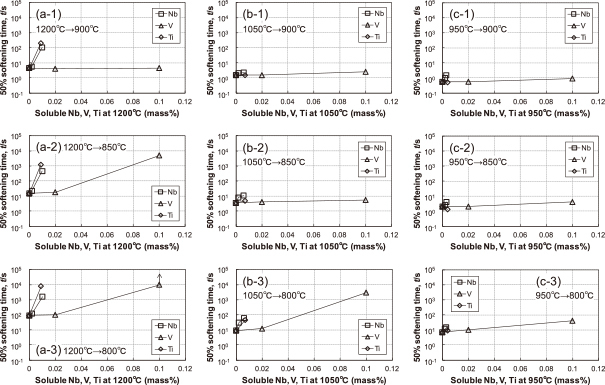 The effects of adding Nb and Ti on the inhibition of recrystallization remarkably decrease as compared with their effects which appear when the austenitizing temperature is 1200℃. In contrast, the very strong effect of adding 0.1% V on the inhibition of recrystallization appears when the deformation and holding temperature is 800℃ (Fig. 8(b-3)). The effects of adding Nb and Ti on the inhibition of recrystallization remarkably decrease. These results are similar to those at 1050℃. 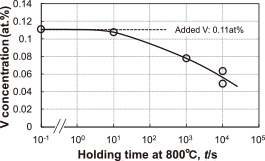 In contrast, the positive effect of adding 0.1% V on the inhibition of recrystallization appears when the deformation and holding temperature is 800℃ (Fig. 8(c-3)). When the austenitizing temperature is 1200℃ and the holding temperature is 800℃, Steel V2 (0.1%V) shows an extremely strong effect on the inhibition of recrystallization (800℃ in Fig. 6(b-1)). In order to elucidate this mechanism, the state of precipitates of the specimen was investigated by TEM and APT. The observation area is considered to be inside an un-recrystallized grain because there are very few recrystallized grains in the observed specimen. Typical precipitates in the specimen observed by TEM are shown in Fig. 9 when the holding time is 104 s. There are relatively coarse precipitates approximately 20–350 nm in diameter containing V. These precipitates are considered to be V carbides because no N peak in the EDS (energy dispersive x-ray spectroscopy) spectrum was confirmed. The specimens that were held much shorter—0 and 102 s at 800℃—were also observed by TEM, but the precipitates containing V were not observed at all. Therefore, the precipitates in Fig. 9 are not the undissolved precipitates which already existed at the austenitizing temperature of 1200℃. Instead, they are considered to form when the specimen was held between 102 and 104 s at 800℃. Scanning transmission electron micrographs showing precipitates in quenched austenite after deformation and holding for 104 s at 800℃ following austenitizing at 1200℃ for 10 s (Steel V2); (a) bright-field image and (b) enlarged micrographs and STEM-EDS spectrum of typical precipitate. V atom mappings obtained by APT measurements are shown in Fig. 10. The holding times at 800℃ of measured specimens are varied from 0 to 104 s. The locations of C atoms are changed by autotempering following the martensitic transformation because the diffusion of the C atom is fast. In contrast, V atoms in the mapping can indicate the original locations even after the martensitic transformation because the diffusion of the substitutional V atom is slow. Therefore, only the distributions of V atoms are shown. It seems that V atoms are uniformly distributed in solid solutions in all the specimens. Only one V carbonitride several nm in diameter is observed in the observation area in the specimen held for 104 s. No distribution of the fine precipitates is observed in other observation areas. The frequency distribution method was conducted to statistically verify the possibility that V atoms form clusters which are smaller than precipitates24). This is a method to detect whether the clustering of atoms exists or not, based on the χ2 test. The data of 3D atom mapping are segmented into some blocks having a certain number of atoms. The histogram of the V content in each block is evaluated to check whether it is in accord with a histogram of the natural theoretical probability derived from a binomial distribution function. The results of the analysis are shown in Table 2. Several blocks with various numbers of atoms were investigated; however, the tendency to deviate from the natural histogram with the holding time is not detected at all. Therefore, no formation of clustering containing V is judged to take place. However, considering that the ion detection efficiency of the present LEAP system is 0.38, extremely small clusters containing V with less than several composing atoms may not be detected. 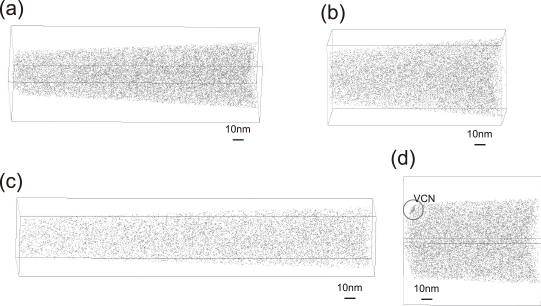 3D elemental maps (V) of quenched austenite after deformation and holding for various times at 800℃ following austenitizing at 1200℃ for 10 s (Steel V2); (a) holding for 0 s, (b) 103 s, (c) 104 s and (d) 104 s (another sample). Table 2 p-value evaluated by the χ2 statistical test of the V distributions in quenched austenite held at 800℃ for various times. The content of the solute V measured by APT is shown in Fig. 11 as a function of the holding time at 800℃. These values are regarded as the V content in solution. In the case of specimens with holding times of 0 and 10 s, all of the added V exists as solute V. In contrast, in the case of the specimen with a holding time of 103 s, solute V decreased by approximately 30%. When the holding time reaches 104 s, the solute V content decreases by approximately 50%. Taking into account the APT results in Fig. 10, the above results indicate that the residual V such as VC precipitate exists in the region, which is different from the observation area of APT. This point will be discussed in section 4.2. Change in solute V concentration determined by APT with holding time at 800℃. The effect of the Nb and Ti additions on the inhibition of recrystallization remarkably decreases by lowering the austenitizing temperature as shown in Fig. 8. This behavior is considered to be caused by the decrease in the solute contents of the alloying elements at the initial austenitizing temperature. 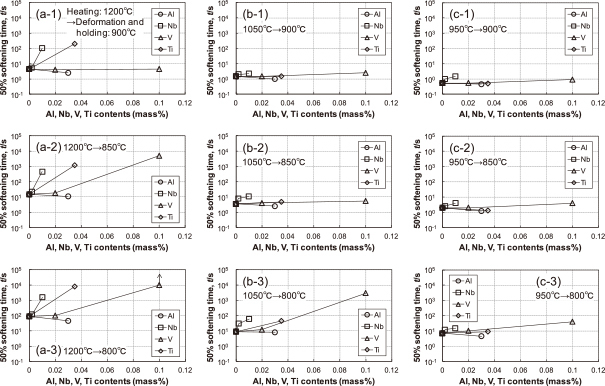 The solute contents of Nb and Ti were confirmed to remarkably decrease by lowering the austenitizing temperature as shown in Figs. 3(a) and (c). When the austenitizing temperature is low, the microalloying elements such as Nb mainly exist as undissolved precipitates. Such coarse undissolved precipitates were confirmed to only have a very weak recrystallization inhibition effect. Therefore, the horizontal axes in Fig. 8 were reorganized as the contents of the solute alloying elements (Fig. 3), which were used in the horizontal axes of Fig. 12. Figure 12 shows the effects of the solute contents of Nb, V, and Ti prior to hot-deformation on the recrystallization inhibition abilities. When the austenitizing temperatures are 1200℃ (Fig. 12(a-1), (a-2), (a-3)) and 1050℃ (Fig. 12(b-3)), the order of the recrystallization inhibition ability of the work-hardened austenite is Nb = Ti > V, when the solute contents of the alloying elements are the same (mass%). By lowering the austenitizing temperature to 1050℃ or 950℃, the contents of the solute Nb and Ti remarkably decrease. Consequently, the inhibition effects of the Nb and Ti additions on recrystallization remarkably decrease depending on the amount of the solute alloying elements. In contrast, the 0.1%V steel shows a relatively strong inhibition effect on the recrystallization even when the austenitizing temperature is 950℃ (Fig. 12(c-3)) because almost all the added V is in solution at 950℃. Effects of estimated solute Nb, V, and Ti contents on the 50% softening time; (a-1) Austenitizing temperature: 1200℃, deformation and holding temperature: 900℃, (a-2) 1200℃, 850℃, (a-3) 1200℃, 800℃, (b-1) 1050℃, 900℃, (b-2) 1050℃, 850℃, (b-3) 1050℃, 800℃, (c-1) 950℃, 900℃, (c-2) 950℃, 850℃ and (c-3) 950℃, 800℃. When the austenitizing temperature is 1200℃ and the deformation and holding temperature is 850℃ and 800℃ (Fig. 12(a-2), (a-3)), the 0.1%V steel shows an extremely strong effect on the inhibition of recrystallization. However, when the austenitizing temperature is 1050℃ and 950℃, its effect becomes very small when the deformation and holding temperature is 850℃ (Fig. 12(b-2), (c-2)). The difference in the effect of the 0.1% V addition on recrystallization in terms of the austenitizing temperature is not caused by the difference in the content of solute V, because all the V content of 0.1% is in solution even when the austenitizing temperature is 950℃. As described in section 3.1, the initial austenite grain size becomes smaller as the austenitizing temperature decreases. Consequently, when the austenitizing temperature is equal to or lower than 1050℃, the initial austenite grain size is considered to be small enough for the nucleation of recrystallization to easily occur in the vicinity of austenite grain boundaries irrespective of the amount of solute V. This is because the promotion effect on recrystallization by the increase in the nucleation site of recrystallized grains presumably becomes larger than the inhibition effect caused by adding V. It is worthwhile to note that the effect of the 0.1% V addition on the inhibition of recrystallization becomes prominent again when the deformation and holding temperature is lowered to 800℃ (Fig. 12(b-3). However, this effect becomes small when the austenitizing temperature is lowered to 950℃ (Fig. 12(c-3)) caused by the same mechanism discussed above. where σ is the surface energy, Vm is the molar volume, f is the volume fraction and r is the average radius of precipitates. In the case of Steel V2 (0.1%V), when the deformation and holding time is 800℃, the critical radii of precipitates to inhibit recrystallization was calculated assuming that the pinning force equals the driving force of recrystallization, namely σ = 0.7 J/m2, Vm = 7 × 10−6 m3/mol and ΔGpin = 10 J/mol33). In addition, the density of the precipitates (the number of precipitates which exist in the representative volume of 100 × 100 × 100 nm) was calculated by assuming that the precipitates have a spherical shape and they are dispersing uniformly in the matrix. Suppose that the whole amount of VC, which is predicted from the solubility product at 800℃, forms by the mechanism of deformation-induced precipitation, the radii of the precipitates to inhibit the recrystallization should be below 1.1 nm and more than 260 precipitates should exist in the volume of 100 × 100 × 100 nm. However, such nanoprecipitates with high density were observed neither by TEM nor by APT. As shown in Fig. 11, the content of the solute V decreased by approximately 50% compared to the added content after deforming and subsequent holding of the specimen for 104 s at 800℃. Therefore, the precipitated V is expected to exist in the matrix; that is, there is a possibility that the precipitated V can be detected in the region different from the observation area of APT. On the other hand, the relatively coarse particles of VC with low density are observed by TEM in the specimen held for 104 s. Consequently, the decrease in the content of solute V can be caused by the precipitation of relatively coarse VC in the region different from the observation area of APT. In the previous study22), the parent austenite structures were reconstructed from EBSD maps of daughter martensite to observe changes in the microstructure of the work-hardened austenite during holding at the same temperature. The initiation and progress of the recrystallization was clearly confirmed in the specimen held for 104 s. This probably implies that the inhibition ability of recrystallization decreases when holding the specimen for 104 s. Therefore, the recrystallization inhibition ability of recrystallization can decrease when the content of the solute V decreases by the precipitation of the relatively coarse VC particles as observed in Fig. 9. The above discussion based on the experimental results supports the hypothesis that the mechanism of the recrystallization inhibition is caused by V in solution. However, the recovery and/or the recrystallization might be inhibited by the pinning effect caused by the extremely fine VC clusters or I (Interstitial)–S (Substitutional) complexes (here, C–V complexes), both of which form by the mechanism of deformation-induced clustering. In addition, the growth of the recrystallized grains might also be inhibited by VC particles with high densities, which precipitate at a particular region, such as the interface between recrystallized/un-recrystallized grains. Investigation into the effect of the carbon content on recrystallization behavior is necessary to independently elucidate the mechanism of the recrystallization inhibition in terms of the effect of the solute V itself, the VC clusters, and the C–V complexes, and is scheduled to be published in a separate paper. (1) When the contents of the solute alloying elements (mass%) are the same, Nb and Ti have an equally strong effect on inhibiting recrystallization, followed by V. The effect of the Al addition and the combined addition of Ti and B are not recognized. (2) When the deformation and holding temperature becomes low, the recrystallization is remarkably inhibited by adding 0.1% V.
(3) The effect of the Nb and Ti additions on inhibiting recrystallization remarkably decreases by lowering the austenitizing temperature. This behavior is considered to be caused by a decrease in the content of the solute alloying elements at the initial austenitizing temperature. In contrast, even when the austenitizing temperature is low, 0.1%V steel shows a relatively strong inhibition effect on recrystallization, as long as the deformation and holding temperature is low. (4) Fine particles were not observed by APT in 0.1%V steel which shows a strong inhibition effect on recrystallization. However, the solute V content evaluated by APT decreased as the holding time increased. When the holding time was prolonged until recrystallization commenced, the solute V content decreased by approximately 50% compared to the added content, and relatively coarse VC precipitates were observed by TEM. The authors would like to thank Takayuki Yamaguchi of NIPPON STEEL & SUMIKIN TECHNOLOGY Co., Ltd. Muroran Unit for technical assistance with the experiments. 1) I. Tamura: Tetsu-to-Hagané 52 (1966) 140–162. 3) M. Ohmori: Journal of the Japan Society for Heat Treatment 35 (1995) 257–262. 4) T. Tarui, S. Yamasaki, M. Tateyama, T. Takahashi and Y. Noguchi: CAMP-ISIJ 10 (1997) 1291. 5) S. Yamasaki, T. Tarui and Y. Noguchi: CAMP-ISIJ 11 (1998) 1242. 6) S. Yusa, T. Hara, K. Tsuzaki and T. Takahashi: CAMP-ISIJ 12 (1999) 1296. 7) S. Terasaki, S. Sakashita, S. Takagi, Y. Kimura and T. Takahashi: CAMP-ISIJ 14 (2001) 1309. 8) H. Hayakawa, S. Terasaki, T. Hara, K. Tsuzaki and S. Matsuoka: J. Jpn. Inst. Metals 66 (2002) 745–753. 10) H. Hirukawa, Y. Furuya and S. Matsuoka: Tetsu-to-Hagané 91 (2005) 390–396. 11) Y. Maehara, T. Kunitake and N. Fujino: Tetsu-to-Hagané 67 (1981) 362–371. 12) L.J. Cuddy: Proc. Thermomechanical Processings of Microalloyed Austenite, TMS-AIME, New York, (1982), pp.129–140. 13) F. Boratto, R. Barbosa, S. Yue and J.J. Jonas: Proc. of the 1st Conf. on Physical Metallurgy of Thermomechanical Processing of Steels and Other Metals (THERMEC-88), ISIJ, Tokyo, (1988), pp.383–390. 14) S. Yamamoto, C. Ouchi and T. Osuka: Proc. Thermomechanical Processings of Microalloyed Austenite, TMS-AIME, New York, (1982), pp.613–637. 18) C. Ouch: Tetsu-to-Hagané 70 (1984) 2081–2089. 24) M.K. Miller: Atom Probe Tomography: Analysis at the Atomic Level, Kluwer Academic/Plenum Publishers, New York, (2000), p.174. 25) K. Narita: Materia Japan 8 (1969) 49–57. 26) R. Phillips, W.E. Duckworth and F.E.L. Copley: JISI 202 (1964) 593–600. 29) H. Sekine and T. Maruyama: Tetsu-to-Hagané 58 (1972) 1424–1437. 32) T. Nishizawa: Tetsu-to-Hagané 70 (1984) 1984–1992. 33) M. Maki: The 161st-162nd Nishiyama Memorial Seminar, ISIJ, Tokyo, (1996) pp.1–27.